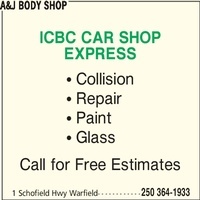 A & J Body Shop Ltd.
Over 50 years providing auto body repairs to the Greater Trail Area. Call or visit them for all your auto body repair & works today. You will be glad that you did! Large or small, theres no job too small! All work guaranteed.